BOGOTA, FEB 8 (EFE). — Colombian palm oil exports increased 10.4 percent in 2015, the Andean nation’s deputy minister for Entrepreneurial Development said Monday. “We must keep working, the sector must increase its productivity since, although we’ve grown in extent, not at the same rhythm in productivity. 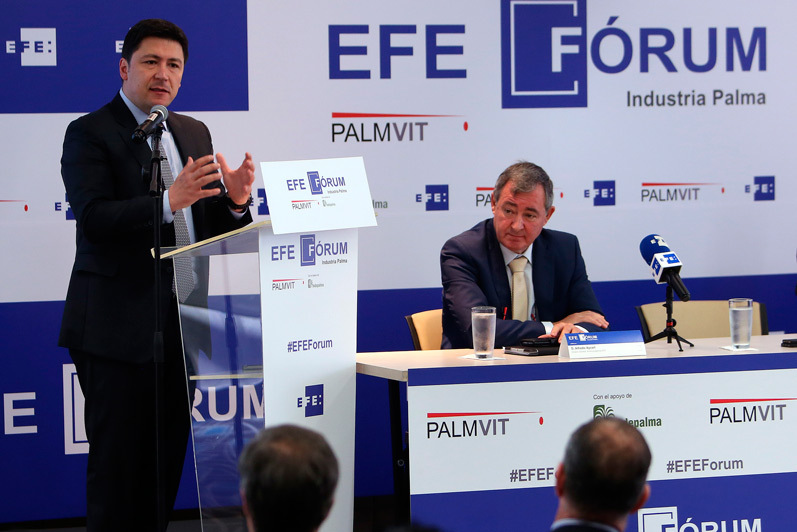 We must focus ourselves on products with greater value added,” said Daniel Arango during the 1st EFE Palm Industry Forum. That versatility enables it to be used in some 250 products in Colombia, he said at the forum organized in collaboration with Palmvit, a Spanish chemical engineering company that specializes in the extraction of vegetable phytonutrients, and the National Federation of Oil Palm Growers of Colombia, or Fedepalma. Arango emphasized that there is “great market opportunity to be opened for (Colombia),” which is the world’s fourth largest palm oil producer and the largest in Latin America. “These are the areas of diversification and technological modernization in which our industrial policy is focused,” the deputy minister concluded.